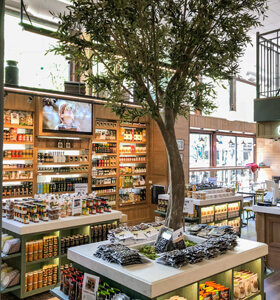 Choose among 800 Greek products from selected small local producers, authentic cold-cuts and cheeses, top quality nuts & dried fruit, as well as fresh fruits and vegetables in our traditional Greek grocery store! Topos means 'place', a place abounding in meanings: meanings, which human labor and creativity have engraved in time making history and generating values. Topos means people profoundly knowledgeable and passionate about what they do. At Topos, you'll sample gourmet creations originating in time-honored localities and crafted by people who, devoted to cooking, honor tradition. Explore Greek flavors, such as our well-known handmade, Greek pita, fresh salads, seasonal soups, delicious sandwiches, aromatic coffee and fresh juices. Last but definitely not least our celebrated authentic Greek yogurt!